Winter Survival Food is now available! This full colour booklet shows you how to forage for wild edibles during the lean winter months, giving your body the nutrition it needs to survive. When we were children one of the fond memories many of us share was playing with the maple tree “helicopters”. These helicopters were also known as “whirlees” or keys. No matter what you remember them as, they are actually called samaras. Maple seeds earned their name as being helicopters because they are amazing auto-rotating helicopters. They begin rotating almost from the precise moment they are released from the tree. Even poorly-shaped seeds rotate with ease. To eat maple tree seeds you need to remove the wings. Some people will eat the seed pod as a trail snack however, many people like to roast or boil them. Maple tree seeds are similar to acorns; the taste can vary from tree-to-tree so trying some from several trees is an option. Better still, the ones that taste bitter, use these for cooking because adding spices can sure make them taste great. Ok, so now you know they’re edible here are a few ideas to get you on your way to enjoying this culinary delight. If you feel eating maple seeds raw just doesn’t do it for your taste buds then boil them for about 15 minutes or until soft. Drain and season with whatever you think you will enjoy (butter and spices). Toss spring maple seeds into a salad. Roast maple tree seeds and eat them as a snack or toss onto a salad or as a garnish on soup. You can roast them by placing the seeds on a baking sheet and sprinkle with spices you like. Bake at 350 degrees Fahrenheit for about 8 to 10 minutes. Try drying out the seeds for something totally different. You can use a food dehydrator, drying in the sun on a hot, dry day, or in the oven at a very low temperature. Once they are dried grind them into powder and use them as a spice, as flour, or as a soup thickener. If you want mashed potatoes like you’ve never had them before, mash your potatoes and add some fresh or roasted maple seeds into the mash! 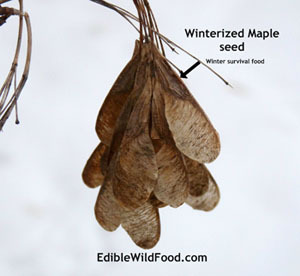 This year give maple seeds a try, they’re free for the taking and in many areas in abundance! Incredible information!!!! Thanks so much for all you do – you are totally amazing!!! Karen what an incredible informative article/blog. I will view the wonderful Maple and its tree seeds with much admiration and gratitude from now on. Thank you for sharing your wisdom and knowledge so generously. You can also eat the young leaves. They are rather tasty when tempura battered and deep fried. My wife is Korean and they are an older but traditionally used food. On page 172 in Paul Pitchford’s Healing with Whole Foods it states that maple seeds are a source of Gamma-Linolenic Acid or GLA fatty acid. Also, thank you for this site! Excellent. what about leaves in the fall? Spring and early summer only from what I have been able to determine. Young maple leaves are edible in small quantities! Merci pour cette excellente info . As with all hard seeds, Phytic Acid abounds in them to prevent wild and domesticated animals from consuming large amounts of seeds.. Phytic Acid causes bowel cramping.., and vomiting to an extent.. Phytic Acid is immediately destroyed when the seeds sprout…, so, the easiest and best way to save on all the energy to boil seeds, is to soak them until they sprout.. The water used should be changed at least 3 times, over the 28 – 36 hours it takes to sprout the seeds/beans/peas of the plant.. Even the preparation of dried beans and peas should be prepared in this matter for consumption.. Once this is done, roasting or cooking to the desired taste is your choice.. You may even consume raw without the danger of any medical effects.. Thanks Will Thompson. I wanted to know, as I’m pulling sprouts, if they’re edible. Sounds like they’re safer than the seeds for the digestion, is that right? Eat your silver maple seeds! can you eat the young sprouts in the spring? i have a big leaf maple. So long as you have no allergies to this tree and in small quantities! The tea from these seeds tastes a little like nettle tea. In a survival situation those shriveled seeds will be welcomed food – albeit it not as nutritious as newly formed seeds. That is precisely why I was interested in them. Today, I spent a couple hours harvesting big leaf maple seeds and got just enough to fill half a shot glass! In a survival situation, effort = calories burned and those calories have to be replenished. If you spend more effort, and therefore calories, on gathering the food than the food returns, it is a bad survival food. I got so little food from the effort that I do not believe shelling them was worth it and the seed pods are not really edible due to the sharp hairs and the really thick shell. I am pretty determined… So I am working on ways to possibly just process them quickly, and efficiently, into a nut milk, which is the only way I think effort versus reward might be good enough. The nut milk made from this species is very thick, and while it would be a total waste of shelled nuts, it may be the only thing to do in bulk with the big leaf maple. In a survival situation the assumption is that there will always be a group of people together to help one another out – people on their own will lessen their chance of survival. Excellent post. Is the samara or seed of Acer pseudoplatanus safe for people to eat as a snack? I have read that it is on some websites but others report it is toxic for horses. If not is there any maple trees that produce seeds poisonous to people? Edible Parts: Leaves; Sap; Seedpod. The sap contains sugar and can be used as a drink or be concentrated into a syrup by boiling off the water. The syrup is used as a sweetener on many foods. It can be harvested in late winter but is not produced in economic quantities[2, 4, 13, 105]. About 25 grams of sugar is obtained from a litre of the sap. The sap can also be used to make a wine. The flow is best on warm sunny days following a frost. The best sap production comes from cold-winter areas with continental climates. The keys of the developing seeds have a sweet exudation on them and this is often sucked by children. The leaves can be wrapped round food such as buns when baking them and they impart a sweet flavour. Great. Thanks Karen. I will try out a few samara. Hope I am not allergic. I just found this site while viewing the abundance of seeds on my Manitoba Maple. Am an avid forager, so am wondering if this type of maple is edible, as I saw no mention of it on all the comments. thanks for any info, and all the other great info on your site! Manitoba Maple seeds contain protoxin which is not good for humans. If humans can consume the seed, I’m thinking deer enjoy also?